..flower has been identified. It is a Dianthus Barbatus. It is in fact not a wildflower but a hybrid that local growers put in their flower beds. I found it in the woods but someone must have accidentally dropped the seed along the path or possibly planted it just to see if it would grow. I went back yesterday to take some more photos and some idiot had picked it. Allah will chop off the hand of anyone who picks a wildflower. Would this qualify for a hand chopping? Not if it is not a wildflower. You can buy it in the store so it is not a rarity of nature. Through about ten people and finally ending up on Peak 7 near my home, the flower that I found recently that no one could name has been identified. A good friend Becky English in Denver suggested I contact another mutual friend Maggie Pederson in Glenwood Springs and she put her contacts in gear and the person answering the question lives about two miles from my house. Talk about a circuitous route. Here is the definition and name according to a local plant grower. "This species is indeed a lovely plant. It would be nice to add it to a Colorado wildflower collection. 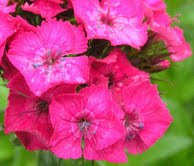 However, it appears to be Sweet William (Dianthus barbatus) and it is not native to Colorado. I am attaching a photo I took of one of my garden-grown Sweet Williams along with a cropped section of Gary Lindstrom's photo and a cropped section of my photo. In the two small photos, you can see the similarity in the hook-like style coming out of the center of the flower. Other identifying characteristics are the contrasting ring near the center of the flower, the "pinked" petals (as though their edges have been serrated with pinking shears), the five, very broad petals, the clustered arrangement of the flowers and the strong rose color."